I have a special fondness for this article I wrote back in 1998. It was one of the first articles I wrote for Curriculum Administrator Magazine before enjoying a ten-year run as an Editor of its successor, District Administration. The article also chronicled some joyful work I did with students who demonstrated competence and good citizenship. This eleven year-old article also describes working in a laptop school (1:1 environment), the timeless hysteria over network security, the trustworthiness of students AND the article is about podcasting before podcasting was cool or even existed. In fact, few schools in the world were online at the time that these kids and I produced a digital radio show on the World Wide Web. “Put on your virtual helmet and goggles! I’ve never tried this before and have no idea if we will be successful.” These cautionary words began my recent work with thirty-two eighth through tenth graders at Melbourne, Australia’s Wesley College.” I then explained to the unsuspecting students that we would spend the next four hours producing and broadcasting a digital radio program on the World Wide Web. My next instructions to the teams consisted of, “decide what sort of information you are going to broadcast, plan, write and record your piece of the program within the next hour.” The students displayed enormous maturity and self-direction in their efforts to decide how to make their piece of the program relevant and interesting. Many of them dispersed so they could conduct a poll, interview or collect other information on the campus. Their cooperative skills were tested when we were only able to find one audio tape recorder on the entire campus. Despite these obstacles, audio tapes poured in after morning tea. While the newly formed teams of producers, writers, directors and reporters fanned out across the campus, the web monkeys went to work. 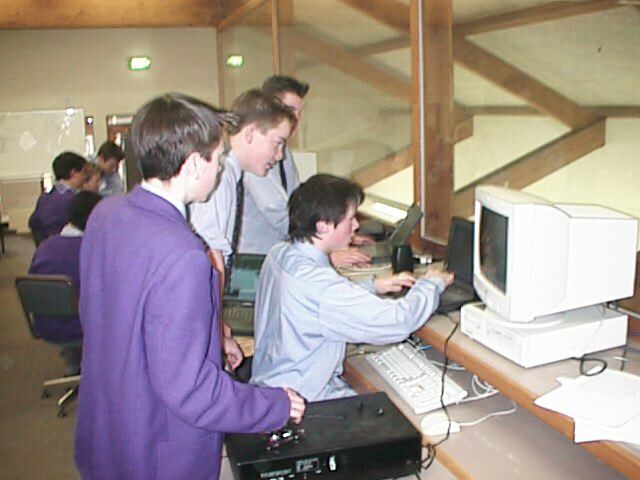 The first dilemma facing us was that I (the teacher) didn’t know how to stream audio files over the World Wide Web. I knew I had to use metafiles, but were not sure how they worked. Five copies of the documentation were made so I could ask my young colleagues to help me figure out the correct process. It didn’t take long before the idea of metafiles made sense. After overcoming that hurdle two kids began designing the web pages needed to contain the broadcast, while the others downloaded tools they would need to digitize and compress the audio. The rest of the team connected an audio deck to the computer and adjusted audio recording levels in anticipation of the arrival of the tapes. Kids even went out and snapped digital photos to include in the web site. Things got a bit hectic when the reporting teams arrived with tapes in-hand. There seemed more than enough work to keep all thirty-two kids busy. One of the web monkeys quickly became dissatisfied with the quality of the school’s desktop computer so he took out his personal laptop and headphones and announced that he would digitize and compress all of the audio clips. A system for naming files was created, communicated and documented so everyone would be on the same page. Another member of the team cut, paste, saved and uploaded meta files to the appropriate server. While two kids continued designing the web site and one student took the initiative to be project manager for the entire process. He demonstrated extraordinary poise and leadership skills while keeping track of tapes, file names and quality control. I was able to bark shorthand instructions to him and he would ensure that the relevant people carried out the task. 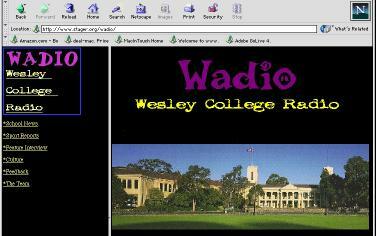 By the end of the four hours a Wesley College School broadcast prototype was up and running on the web. We decided earlier in the day to call it WADIO. A bit less chaos, more time and more experience would have allowed all of the audio files to sound great. However, the kids did a remarkable job in a very short period of time. Their creativity, technical fluency and collaborative skills continue to inspire me. One group figured out that they could dub their music reviews over clips from the CD. The feature interview group decided that “everyone interviews the principal” so they proceeded to interview one of the cleaners and “tuck shop” (cafeteria) ladies. The most pleasant surprise was found on the culture page. The students not only reviewed popular music CDs and movies, but included an excellent review of George Orwell’s “Animal Farm.” Trusted with responsibility for their own learning, kids will often exceed our curricular expectations. Information wants to be free. The immediate reaction of some school personnel was that the broadcast would run better if it were on the school’s Intranet. This is a big mistake. Kids should have as big an audience for their work as possible. Parents might want to listen from work. Students might want to know what time the football game starts from home and students on distant shores might be inspired by the work of peers halfway around the world. You may listen to the original audio production at this link (as long as the technology still works). For several years I traveled around the world sharing the story of WWWadio as an example of how the computer can be used to enhance personal expression and offer a global audience. Another lesson had to do with network security and student trustworthiness. 1. They needed server access in order to do their work. 2. I was too busy teaching to constantly be interrupted in order to type a password into student computers. 3. I believed that if I trusted the students with my Web server, they would behave responsibly. Besides, the server was backed-up in case something went wrong. 4. The kids were so busy that they were likely to forget my password. 5. It’s just a damned server. I never bothered to change the server password following the WWWadio class. At presentations I proudly proclaimed how the students did not harm my server, despite having root access. This was a stunning dose of reality for educators fearful and suspicious of children. One day, I found an unfamiliar folder residing on my Web server. Since I’m such a disorganized person, I just figured that I had accidentally created a folder or assumed that my service provider had placed it there. Curious, I looked at the contents of that mystery folder through a Web browser. Surprise! The Australian private school students had been maintaining a school-related newspaper on my server somewhere in the United States for 2-3 years without my knowledge, and more importantly, without doing any damage to the server or any of its other contents. That’s right, despite the high tuition fees the students paid, the fact that they every student has her own laptop AND the school’s millions of dollars worth of networking infrastructure and personnel, students found the school network unreliable or too difficult to use in a way that suited their needs. It sure is a shame how much time, money and personnel schools spend on computer networks only to complicate or cripple them. Who are the Digital Immigrants Now? Huh? The New York Times article, Who’s Driving Twitter’s Popularity? Not Teens, punches another whole in the ageist nonsense known as the digital immigrant/digital native BS. That bogus theory fetishizes youth culture and allows middle-age adults, primarily educators, to say, “Don’t trust anyone over thirty,” in an act of self-loathing and anti-intellectualism. “The traditional early-adopter model would say that teenagers or college students are really important to adoption,” said Andrew Lipsman, director of industry analysis at comScore. Teenagers, after all, drove the early growth of the social networks Facebook, MySpace and Friendster. I wrote about this issue long ago in Tech Insurgents: Do your teachers need a computing IEP? and Digital Native Theory Further Disproved. However, billionaire tech entrepreneur Mark Cuban had the definitive word on the alleged digital generation gap. I arrived two days ago amidst freezing wind and rain in my beloved second home of Melbourne, Australia. This is my thirty-something-ith trip to Melbourne since I began working here 19 years ago. My love for Melbourne is only second to that of New York City. I cherish my long-time friendships and the remarkable work I’ve been able to do. Tonight, I will participate in the formal graduation ceremony where I will receive the testamur for my Ph.D. and get a really good poofy hat. In fact, according to the rules sent to me, I shall expect much bowing and doffing of my bonnet. I finished my Ph.D. several years ago, but have remained a GRADUAND (a word I thought was a typo until googling it). I’m finally able to attend the festivities and enjoy the punch and cookies. Since I am no stranger to humiliation, I will post a photo of the poofy hat as soon as I have possession of said bonnet. I wish my parents and family were here to share this special milestone. © 2008-2009 Gary S. Stager, Ph.D. I intend for the publication of this article to signal a renewed commitment to writing new articles about 1:1 computing while also making seminal articles on the topic available in the near future. When I led professional development activities in the world’s first two “laptop schools” back in 1990, the most unusual variable was not that fifth through seventh graders each had their own truly personal computer when neither I nor any of my colleagues did. The most unique characteristic of these two schools and dozens of others that followed was the way in which those laptops were used. Although it seems like prehistoric times, there were drill and practice programs, “educational” games, collaborative online projects and productivity packages widely available even before the first Gulf War and a few years before the existence of the World Wide Web. Despite this range of seemingly easier options, the original “laptop schools” embraced computer programming, particularly Seymour Papert’s LogoWriter and its accompanying constructionist philosophy. The schools chose to do something hard with their laptops – something Papert might call, “hard fun.” Then as now, this approach stands in stark contrast to those who embrace computers as productivity enhancers, test score improvers or back-of-the-classroom amusements. The laptop would serve as an incubator for powerful ideas – an intellectual laboratory and vehicle for self-expression. Since the personal laptop, as expressed by Alan Kay’s 1968 plans for a Dynabook, was itself inspired by observing young children program in Logo, countless schools around the world embraced Logo and its potential. Large international conferences were held. Books were written and millions of copies of Logo were installed. I embraced the Logo philosophy, led hundreds of teacher workshops and even edited a journal dedicated to its implementation. However, at Australia’s Methodist Ladies College in Melbourne and the Coombabah State School in Queensland, something demonstrably different was underway. I remember returning home from Australia in the early nineties and presenting projects programmed by children in LogoWriter to audiences at educational technology conferences in the United States. One of my heroes, a fantastic longtime Logo-using teacher looked at the projects on display and remarked, “Oh! That’s what it looks like when the kids have time.” The work of children in laptop schools possessed a level of sophistication unparalleled then or today. Since the early 1980s, many of us believed in the intellectual and creative abilities of students that would be amplified by Logo programming, but such goals often remained elusive where there just were not enough computers or time available to realize our aspirations. Students with their own personal laptop computer could now spend the time necessary for the task at hand. Each success would inspire project elaboration or the testing of a larger hypothesis. Errors in thinking or execution required complex debugging strategies. While the laptop inspired previously reluctant students to become passionate learners perhaps interested in schoolwork for the first time, kids were able to integrate the skills and techniques taught them into personally meaningful projects. Such projects frequently outpaced the imagination of the curriculum or a teacher’s standard expectations. This was not only tolerated, but also embraced as the catalyst for wholesale school reform and innovation. Not only had the early “laptop schools” invested in computers, they did so in order to disrupt the status quo in a deliberate fashion. MLC Principal David Loader quoted Holt, Dewey and Papert in memos to parents, essentially saying, “We love your children and the tuition that you send us, but frankly our school isn’t good enough.” This was quite a bold statement to share with the community, especially when one of the first two “laptop” schools was a private school dependent on parental investment. Their decision to “go laptop” passed a 27-member board by one vote and cost each parent thousands of dollars for a laptop at a time when few adults owned one. Loader and his pioneering colleagues were ready to learn from the laptop experience and make whatever changes in schooling that the experience required. The implementation of laptops was never referred to as a pilot, project, initiative or experiment. There was an expectation that the provision of personal portable mobile multimedia computers for every student would pay educational dividends in excess of their cost and disrupt traditional pedagogical practices. Attitudes towards class size changed overnight when 15-30 projects needed to be supported in every class. Within a year, English, History, Geography and Religious Education teachers demanded a three-hour humanities block during which all of the subjects could be integrated via a project approach. Forms of assessment and the curriculum changed. Students working on a humanities project had to engage in sophisticated mathematical thinking and computer science while their teachers observed the need to blur the artificial boundaries between subject areas, plus learned the value of collaboration with peers and students. Countless professional development opportunities were created. Even architectural plans needed to be revised since students were now mobile in ways never before anticipated. Teachers who were required to pay roughly 25% of the cost of their own laptop, requested that vendors come to school to demonstrate the $5,000 laser printers some purchased with their own funds for use at home. Teachers read books about educational theory and discussed the nature of teaching and learning informally over lunch. Older teachers nearing retirement, yet confident in their ability, spearheaded the use of laptops and LogoWriter. These veterans were trusted and admired by younger colleagues with neither the technical or pedagogical expertise to innovate on their own. Average teachers wrote papers in order to present at conferences and enrolled in graduate school. The status of teachers was elevated where it mattered most – in the heads and hearts of the teachers themselves. Today, dozens of teachers from the original “laptop schools” are school principals, professors, and corporate presidents around the globe. Expecting a professional to use professional tools enhances their self-image and improves their sense of professionalism! The early “laptop schools” invested in a wide range of sophisticated professional development strategies that could provide and sustain momentum. Traditional workshops were available in addition to opportunities for school visits and post-graduate study. Veteran teachers were relieved of some teaching duties so they could mentor colleagues in their own classrooms. Schools employed me sometimes for months at a time, to do whatever I deemed appropriate for improving the quality of the school and I had complete access to principals eager to consider my recommendations. Such willingness to learn, lead and support serendipity has sadly diminished with each passing year. However, in the early nineties I was able to convince multiple schools that the only way their teachers could teach in new ways was for them to learn in new ways. So, on numerous occasions I took dozens of teachers away for what became known as “slumber parties” during which they would learn to learn with computers in exactly the ways we hoped their students would learn – with the same software and personally meaningful project-approach. If a teacher wished to learn computer mechanics or how to use a particular productivity tool, they could enroll in the school’s community education program, free-of-charge. Such learning opportunities were always on a teacher’s own time and outside of school-based professional development focused on learning. 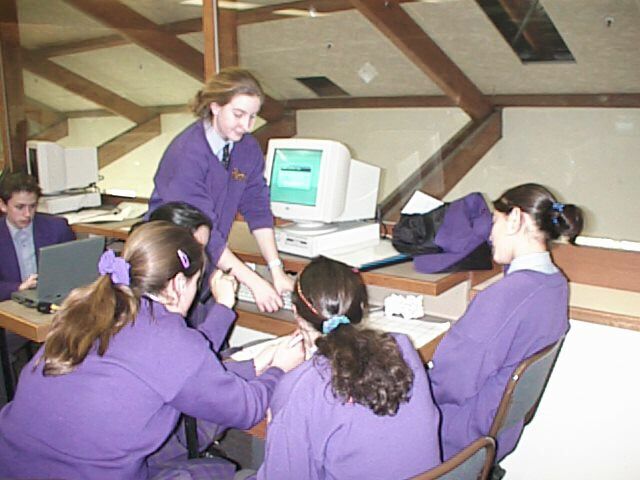 Many teachers apprenticed with me in computer camps offered during school vacations. This benefitted kids and working parents in addition to creating an informal, yet powerful professional development vehicle for a steady supply of teachers. Successful school leaders sustained progress by continuing to innovate while ever mindful of the need to remind their employees and community to keep on pushing. The best school leaders create rituals to honor and preserve worthy efforts while challenging others to continue growing. Today, I speak at many 1:1 events and participate in panel discussions where a colleague will reflexively alert the audience that, “This is hard.” Such warnings seem a precondition before implementing laptops or even accepting the inevitability if 1:1 computing. It has never been a matter of if, but of when. Our deliberations too often descend into adolescent debates over whether laptops can go home or how many white boards to purchase (my answer = none) or how we will keep kids off the Internet; all the while focusing on the constraints rather than on the affordances of this protean device. The laptop not only helps kids learn what we have always wanted them to know, but allows them to know things that were impossible to know and to do things unimaginable just a few years ago. Sadly, as the technology has become cheaper and more ubiquitous, its use in schools has become more cautious and pedestrian. I rarely encounter the learning renaissance or explosion of classroom creativity I experienced pre-1996. This is not an indictment of the technology, but of schools and a failure of leadership. It is not the technology that has failed, but our imagination and willingness to engage in reflective practice. Perhaps it is too hard to use laptops in transformative ways in the NCLB era when public schools are being shamed and oppressed by standardized testing while independent schools embrace such draconian practices as a vulgar marketing tool. It seems easier to pretend that the world has not changed or that understanding computer science is irrelevant to nearly every walk of life. Our schools increasingly adopt technology policies that treat teachers and students like imbeciles and felons. Maybe, it’s all just too hard! In retrospect, asking parents to spend $3,000 in 1990 per student laptop seems hard. Asking teachers to learn to program computers and teach students to do the same seems hard. Requiring teachers to spend their own money to help purchase a laptop while asking them to challenge all of their basic assumptions and beliefs about the nature of teaching and learning seems hard. Expecting principals to lead, inspire progress and make dramatic change palatable to the community seems difficult. The crazy thing is that I don’t remember any of the work I did in “laptop schools” as being hard. The work was so exhilarating and the benefits of collaborating with joyful learners and curious eager energized teachers was so rewarding that it all seemed effortless. Easy as pie! That’s right, setting the stage for the tens of thousands of schools around the world who have since considered or embraced 1:1 computer was easy! Convincing parents to buy their child a laptop was easy. Teaching thousands of children and their teachers to program on floppy-based laptops with monochromatic displays and a megabyte of RAM was easy. Creating productive contexts in which innovation and progress would continue in my absence was easy because the adults saw with their own eyes how children are competent and deserve the richest range of intellectual and creative opportunities imaginable. Now, if I can just convince a few more adults and policy-makers how easy it really is to change the world! At last January’s Educon 2.1 Conference I enjoyed the great privilege of serving on a panel discussion about school reform with a number of impressive educators. For eight months I have been carrying around the notes I wrote for my opening with the intent of publishing them online. The following list is designed to stimulate thought and dialogue. The points are made in no particular order of importance. We must not rank or sort children. The teachers and parents within a particular school community should make all curriculum decisions. Every child is entitled to a rich joyous education filled with art, music, drama, computer science, apprenticeship experiences and access to high-interest reading materials during the school day. Teachers must never yell at children. Regardless of factors outside of school – including poverty and other social pathologies – the classroom should be an oasis representing the best 6-7 hours of a child’s day. We must not punish children for the sins of adults. Every child is entitled to a talented, loving, passionate professional teacher who herself continues to learn and grow in a setting free of fear or coercion. It is wrong to be mean to children. External assessment is always disruptive and interferes with learning. Tech Insurgents: Do your teachers need a computing IEP? Computer-generated mind maps are presented to the community as justification for the technology investment while they represent little more than high-tech napkin scribbles or a book report outline. Wiring is mistakenly confused with innovation while we hold on with all our might to the ridiculous mythology of drill-and-practice. The only transformation in the software industry is the ever-changing collection of ways it disguises that you’ll be gonged if you get a long division problem incorrect. Integrated learning systems, classroom performance systems and adaptive instruction are clever euphemisms for turning classrooms into high-stakes game shows. This is just 1980s Math Blaster without that pesky patina of fun. Teachers who don’t use computers aren’t digital immigrants; they’re digital ninnies. All sorts of excuses are made for why the most powerful intellectual instrument ever invented, the computer, has had so little impact on schooling. We blame a shortage of professional development, funding or quality software. Publishers, politicians and principals are also accused of impeding educational progress with their hierarchical mandates. Yet, the simple fact remains that a quarter century after microcomputers entered your schools a minority of teachers use them and an even smaller percentage do so in a way that increases opportunities for all learners. Fifteen years ago I had the good fortune to lead professional development at the first two schools where every child had a laptop. Wondrous student work emerged and a good number of educators even “transformed” their teaching practice. Yet, it seemed impossible to reach the “tipping point” when the vast majority of teachers used computers in constructive ways. 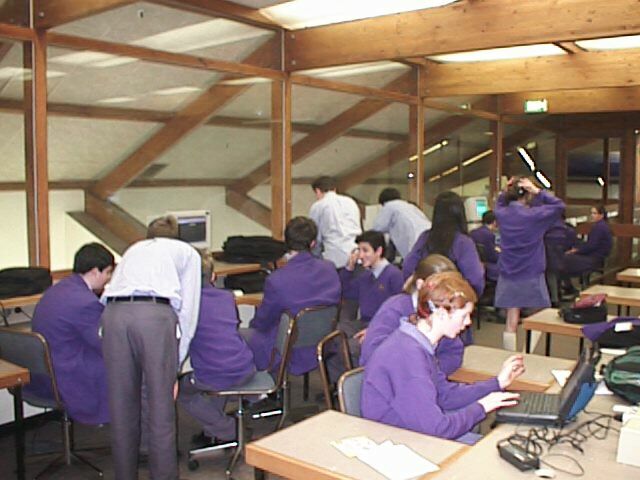 It turns out there was a staff member, ironically an IT teacher, who would take colleagues aside and tell them not to worry about the laptops or the silly talk of innovation. “This too shall pass,” he suggested. This one teacher caused inestimable damage before moving to several other schools and repeating the pattern. Many schools harbor such low-tech insurgents and pay too little attention to their potential for destruction. You are not noble defenders of childhood innocence or pedagogical excellence. You have managed to block student access to critical learning opportunities and intellectual tools for more than 25 years. There is no acceptable excuse for cheating a generation of children. We love cute little cliches referring to children as digital natives and adults are mere digital immigrants. Not only is this simplistic aphorism insulting to the millions of grown-ups capable of using a computer, but it also provides cover for the teachers who have refused to enter the last quarter of the 20th century. After all, they’re special. Why not call such teachers digital ninnies? How about non-learners? Students should not be entrusted to adults so oppositionally defiant as learners. An IEP would be created for a child who displayed such an unwillingness to grow. School leaders need to expand their vision, raise expectations and use precise language they are indeed going to transform education for the next generation of learners. Let’s cut the baloney, increase access and share compelling models of what children can learn and do with computers. Gary Stager, was editor-at-large for District Administration Magazine and is a Visiting Professor at Pepperdine University. Do your teachers need a computing IEP?